Share the post "Slick Single-Shot Surgeon for the Boss's Daughter"
Now through October 31, 2007, the Jewell AR15 trigger is on sale at MidwayUSA for $189.99, $14.00 off the regular price. This quality two-stage trigger, item 709049, allows sear engagement and trigger pull weight adjustment from the top of the lower receiver without disassembly of the firearm. Since it adjusts from 1.5 to 6 pounds, the Jewell trigger suits many disciplines–paper punching, Service Rifle Matches, and hunting or defensive uses. The trigger kit includes trigger, trigger spring, disconnector, hammer and hammer spring. Installation tools and detailed instructions are included. This editor fitted the Jewell trigger in a couple ARs–installation is not that difficult. 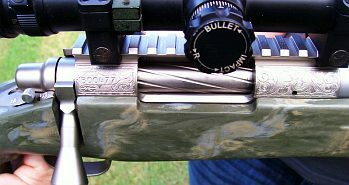 But if you are all thumbs, you may want to have a gunsmith mount the trigger and adjust it to your desired pull weight. 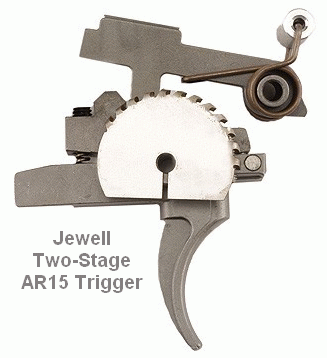 Share the post "Jewell AR15 Trigger at MidwayUSA"